This pretty National Trust Ickworth Summerhouse has been installed in Frimley, Surrey, in our customer’s garden, sat between their outdoor swimming pool and their pool house/changing room, to use as an attractive storage shed for their garden furniture. The National Trust Summerhouses are traditional summerhouses, purely intended to be used for the summer months. 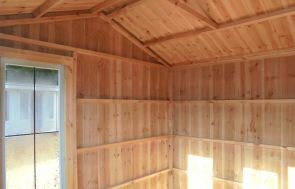 This means that they are not lined or insulated on the inside, so they are essentially a standard shed, but with a more attractive shell, which is exactly what the customer wanted. 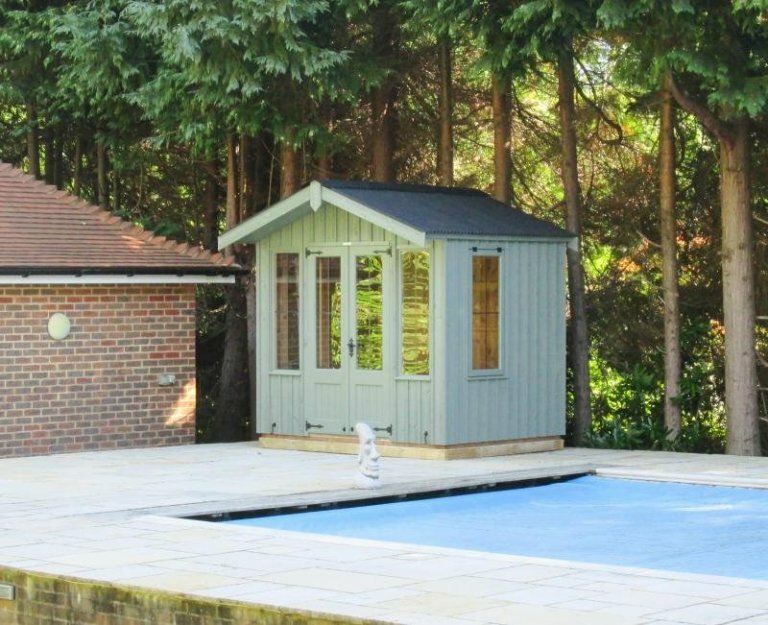 The Ickworth has got an apex roof with a roof overhang over the front gable, giving the feel of a beach hut, which is why the customer thought this design was the most appropriate to sit next to their swimming pool. The National Trust range is traditionally styled, with corrugated sheeting on the roof, vertical sawn boards for the external cladding, leaded windows, and Fleur-de-Leys style, black cast iron door and window furniture. Terrace Green, from our National Trust paint range, is the colour the customer chose, which fits in very nicely with the trees behind the summerhouse. 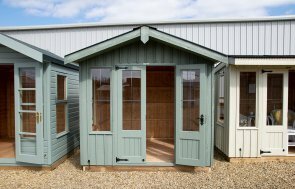 For more information on our range of Garden Sheds and Summerhouses, you can build and create your own by using our Online Garden Building Planner Tool, or you can come and visit our Sunningdale Show Centre to see the buildings for yourself. Alternatively, you can also call us on 01760 444229 and ask our helpful team any questions you may have.